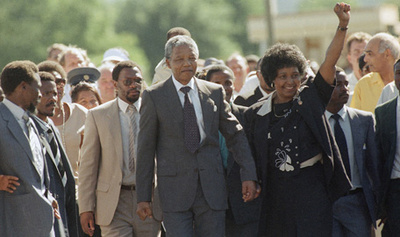 February 11th, 1990 Nelson Mandela, leader of the movement to end South African apartheid, is released from prison after 27 years. Mandela spent the first 18 of his 27 years in jail at the brutal Robben Island Prison. Confined to a small cell without a bed or plumbing, he was forced to do hard labour in a quarry. He could write and receive a letter once every six months, and once a year he was allowed to meet with a visitor for 30 minutes. However, Mandela's resolve remained unbroken, and while remaining the symbolic leader of the anti-apartheid movement, he led a movement of civil disobedience at the prison that coerced South African officials into drastically improving conditions on Robben Island. He was later moved to another location, where he lived under house arrest.